The claim that saturated fat isn’t actually bad for you has always been one of the most controversial parts of Paleo. 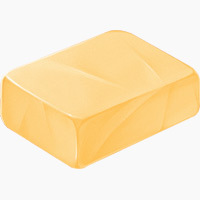 Plenty of people are willing to accept that too much sugar is probably bad for you, or that olive oil is a healthy food, or that they need to be eating more vegetables, but butter? Lard? Tallow? Those are health foods? Paleo arguments in favor of saturated fat range from the historical (plenty of traditional societies ate lots of saturated fat but enjoyed low rates of heart disease) to the biological (refined carbohydrates are much, much worse for your heart than any amount of butter). The bottom line is really that naturally-occurring saturated fat from whole foods is not dangerous. Going over the whole Paleo case in favor of saturated fat could fill several books, though, so today, we’re just going to look at the most recent research. “The question being asked, it seems, is: Is saturated fat truly harmful? The right question is: Is all saturated fat created equal? Specifically, “saturated fat” covers several different types of fatty acids, like stearic acid, lauric acid (that’s the one in coconut oil), and myristic acid. All of these different fatty acids have different effects, and foods that contain “saturated fat” contain different combinations of them. So just studying “saturated fat” is so imprecise it’s almost useless. What’s more, most actual foods contain more than one type of fat. Most animal fats are roughly equal parts saturated and monounsaturated. We know from the Omega-3/Omega-6 issue that the health effects of certain nutrients often depend on other nutrients. So unless you’re going around eating pure saturated fat supplements, what you really care about is how different foods, or better yet, different dietary patterns, affect health. Two of the biggest source of saturated fat in the American diet are pizza and “grain-based desserts.” (e.g. packaged cookies, crackers, cakes, ice cream sandwiches, etc.) This means that in the American context, “a diet high in saturated fat” means “a diet high in junk food.” In terms of dietary patterns, this is obviously a bad one, but there’s a lot more going on there than the saturated fat! So instead of looking at data about just “saturated fat,” here are some recent (post-2010) studies specifically looking at foods you might actually eat on Paleo. Eggs are the poster child for highly nutritious foods that contain saturated fat, with both the nutrients and the fat located in the yolk together. In this study (2013), subjects on a moderate-carb (less than 30% of calories) diet, eggs actually reduced inflammation and improved blood lipid profiles. Another welcome consequence of looking at whole foods rather than “saturated fat” has been a greater awareness of the distinction between fresh and processed meats. This study (2010) found that “Consumption of processed meats, but not red meats, is associated with higher incidence of CHD and diabetes mellitus.” In other words, when you separate out the hot dogs and McRibs from the home-cooked chuck roast, all that “evil” red meat starts looking a lot less dangerous. Another area that’s been getting more and more attention recently is the history of the low-fat crusade. Instead of asking “how do we know saturated fat is OK?” more people are asking “where did we get the idea that saturated fat is bad?” – and what they’re mostly finding is a tangle of marketing, political entanglements, and conflicts of interest, not necessarily good science. The Big Fat Surprise (Nina Teicholz, 2014) (You can get a quick preview of her argument here). The author fingers excess PUFA, fructose, and sugar generally, as well as an imbalanced Omega-6 to Omega-3 ratio, for most of the diseases typically blamed on saturated fat. And really, that sounds a lot like the Paleo take! Obviously, there’s still a lot of inertia and bias to overcome – people have been so used to avoiding saturated fat that it’s become almost automatic, and correcting the mistakes will take serious effort. But the tide finally seems to be turning in the right direction, with a focus on foods over nutrients, and an acknowledgement that “saturated fat” isn’t just one monolithic thing. And that’s always something to celebrate – maybe with a nice bowl of coconut ice cream to get all those healthy fats on your plate!